ECOMM CURRENT OPENINGS: Opening in Marketing in FMCG COMPANY. Urgent Requirement. 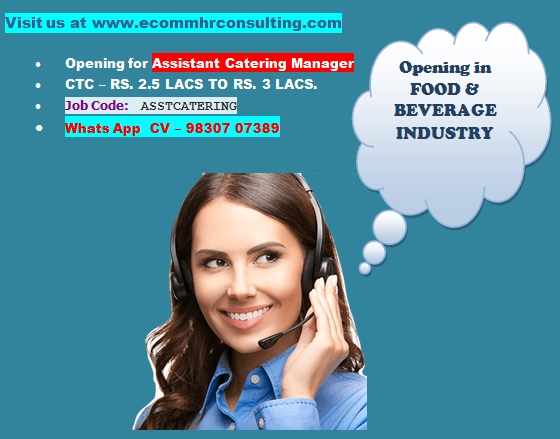 Opening in Marketing in FMCG COMPANY. Urgent Requirement. Qualification: HS Passed can apply. Take Home Salary - RS.7000/- P.M to RS. 12000/- P.M plus incentives. Our client is a leading manufacturer of Consumer Consumables. Direct Sales to end users. Meeting end users in crowded places like important crossing, Metro terminals and other crowded places. Interaction with end users in the stalls taken in the event.